We are a group of students inventing tomorrow's solutions today! Our four provisional patents and our utility patent are examples of our "why not' philosophy. We excelled in a youth program called FIRST LEGO League (FLL). Check out www.usfirst.org/roboticsprograms/fll. In April 2010 we were named the top FIRST LEGO League team in the world! We formed a 501c3 nonprofit charitable organization in 2011 to help youth get involved in STEM and then in 2013, we started our own company! 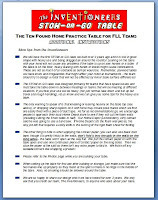 Lots of teams are building our STOW-or-GO™ Home Practice Table this season so we thought since we're getting so many requests, we'd post the latest instructions here on our blog. Click the images below to see the documents and make sure you check out all of them before you start building. 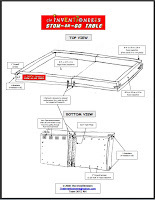 Have a great season and email us to let us know if you are using the STOW-or-GO™! Check Out Our Newsletter ! 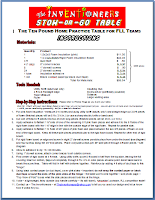 Top Resources for Rookie Teams at Your Fingertips! I1.Dear Inventioneers . . . . Visitors From 129 Countries, 191 Flags Collected, 50 States and DC! 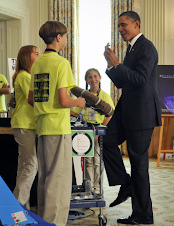 President Obama - a SMARTwheel Fan! Sign Up for Our FLL Tournament Newsletter Here! Looking to find a Team? We'll try to help! Send your tournament videos by posting a video response on Youtube! Check out our latest Don't DUIT press coverage! Hooray, our fish came back! Just click in the blue square to feed them.